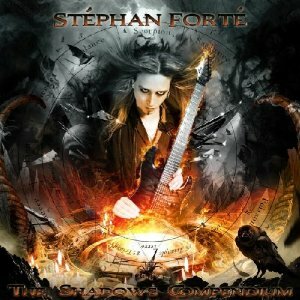 Hall of the Mountain King: Review: Stephan Forte, "The Shadows Compendium"
I’ll admit that my aversion to these things springs, at least a little, from jealousy. I love playing guitar, but I’ve struggled and fought for every note that I’ve ever wrung out of the instrument — and truth be told, most of those notes probably should have stayed in it. So, when I see guys like Forte, whose fingers fly across the fretboard with preternatural grace and seemingly little effort, it raises in me this odd mixture of disgust and complete fascination. Realistically, I know that it took a tremendous amount of work and dedication for those guys to get to that level, but they often make it look so easy that I want to poke my lip out and say “no fair” like my six-year-old. My own childish jealousies aside, though, a big problem with a lot of shred instrumentalists is that their songs often turn into seven minute wankfests that amount to them jumping and down and screaming, “look what I can do.” On his first solo record, Adagio guitarist Forte shows the skills of a classical composer, though. Oh, he gets his mind-blowing shots in, but it all manages to work in service of the songs. Forte gets a little help here and there from some other heavy hitters of the metal world. Nevermore guitarist Jeff Loomis joins him on the opening title cut, a dark and brooding beast that gives way to a quieter interlude that finds Forte mimicking a sitar before cranking back up for a big finish. Then, former Megadeth and King Diamond guitarist Glen Drover drops in to add some serious crunch to “Duat,” probably the heaviest song on the record. The virtuoso piece of the record, though, is second track “De Praestigiis Daemonum.” Even though this song is pretty much all about the shred, it still has a flow to it — and the angular, Meshuggah-esque riffs here are an interesting twist. Though the neoclassical chops are the mainstay of Forte’s arsenal, they’re not the whole show. “Spiritual Bliss” opens with a few licks that have kind of a jazzy guitar feel and offers some soaring single-note bends before the shred kicks in. “Sorrowful Centruroide” opens with some furious acoustic strumming and has more of a power ballad feel — some of the licks remind me of Testament’s “Return to Serenity.” “I Think There’s Someone in the Kitchen,” which definitely qualifies as the misfit song title of the record, often has a pure rock ‘n’ roll feel. The Shadows Compendium is a shred instrumental albums that can blow your mind while you’re listening to it, yet leave you humming the melodies hours later. That’s a rare and beautiful thing.